..schön that you stop by! With attention to detail and anticipation of our guests, we have taken a lot of effort that you feel comfortable with us! Enjoy the Oldenburger Münsterland alone or up to max. 3 adults or 2 adults and two children. Upper apartment with separate entrance (quiet location in settlement). Parking directly on our property. The apartment around Friesoythe, district Ellerbrock is about 50 square meters and consists of a large light-filled living room and bedroom with a fixed partition wall and two roof windows. The house was built in 2006. 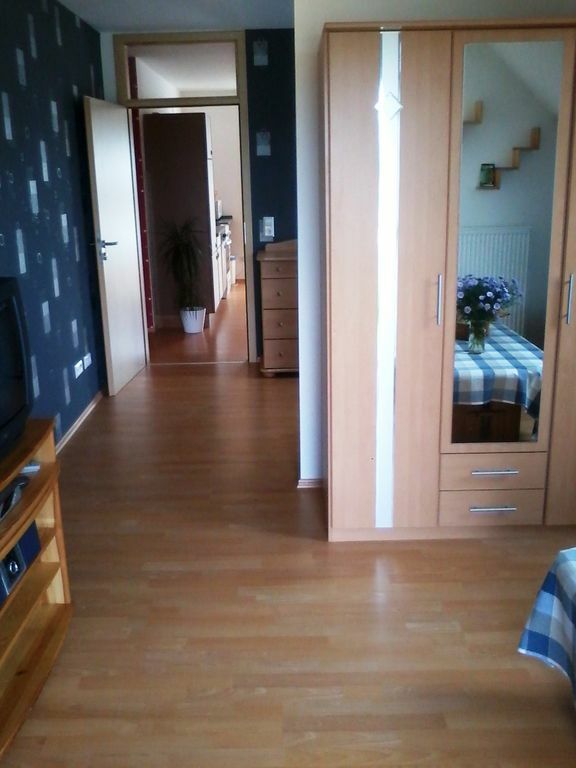 Among the facilities in addition to two beds and a large sofa bed (1.40 m) is still a large kitchen incl. A fitted kitchen with fridge, freezer, microwave, and dishwasher. The location is perfect to start a nice bike ride. You can perform exciting day trips within Ellerbrock. A garaging and a charging station for e-bikes are available. We will gladly arrange a rental bike from the neighboring bicycle dealer. You also get a great idea of ​​the provided brochures, which you can browse in peace with a glass of wine. To your special wishes we are happy to take care of. Please contact us. -. If necessary, for the time being parked in the turning area and please at Erlenkamp No. 5 (!!!) ringing. Gasthof Laing 150m. Sportplatz Ellerbrock 200 m. Hof Peters (flea market) 400 m.
Bus stop (Ellerbrock Sportplatzstraße) 150 m.
Schöne ruhige Ferienwohnung mit seperatem Eingang . Freundlicher Kontakt vor Anreise und während des Aufenthaltes. Da abseits gelegen ist ein Auto unbedingt erforderlich. Im Mietpreis inbegriffen sind die End-/ bzw Zwischenreinigung sowie Hand- und Badetücher und Bettwäsche.